Even when missing a couple of legs, this brown recluse had no problem capturing and subduing her prey. This spring gruesome images circulated on the internet of someone who had purportedly been bitten by a brown recluse spider. A debate followed about the reliability of the diagnosis. Some held this was indeed a brown recluse bite while others claimed the wound was caused by a secondary infection of one of the flesh-eating bacteria such as Streptococcus or Staphylococcus. The bottom line is that we will never know for sure what caused the nasty wound. No spider was captured or identified. To know if the bite of a spider is responsible for a lesion, it is best to capture the perpetrator. This does not happen in most cases. I have seen estimates that as many as 80% of the wounds and rashes attributed to bites by spiders actually resulted from a host of other causes including secondary infections by flesh eating bacteria, Lyme disease, fungal infections, and diabetic ulcers to name a few. The brown recluse is often implicated in these skin lesions because its bite is known to cause tissue damage that can be severe and disfiguring. Several of the enzymes found in brown recluse venom are responsible for breaking down the membranes of cells and causing cells to die. However, even if someone is bitten by a brown recluse, severe skin damage or other complications are seen in 10% or less of the cases. States in the home range of the brown recluse include Iowa, Nebraska, Indiana, Illinois, Ohio, Kentucky, Tennessee, Missouri, Kansas, Oklahoma, Arkansas, Georgia, Alabama, Mississippi, Louisiana, and Texas. To see a map of the distribution of brown recluse and other recluse spiders, go to the following link.http://spiders.ucr.edu/images/colorloxmap.gif. 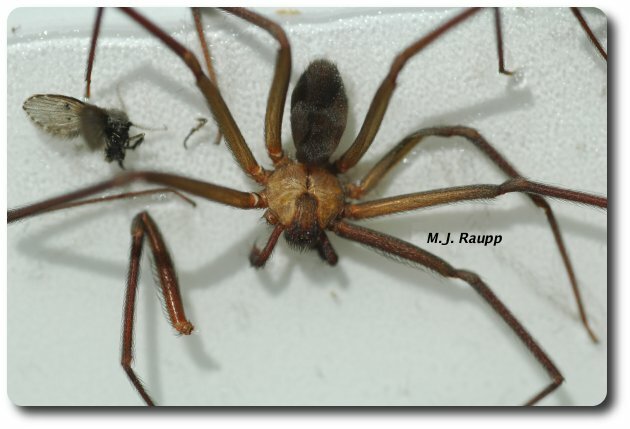 It is noteworthy that the brown recluse is known to move from the infested area with furniture and belongings as a stowaway. This can result in isolated breeding populations in states outside of the generally infested zone. The fiddle-shaped mark on the back of the brown recluse is useful in identifying this species. The spiders in this Bug of the Week came from a facility in Maryland that has a resident population of brown recluses. They probably arrived with furniture or equipment from one of the infested states. I searched the facility in Maryland for more than two hours and, although evidence of the spiders was common, I found none. Despite the fact that this workplace is infested no one has ever been bitten. This is not unusual for the brown recluse. As the name implies, they are hard to find. They like dark, dry, undisturbed places such as barns, sheds, and garages. In homes they are found in closets, attics, and other storage areas. They can hide in furniture, bedding, and clothing. They forage mostly at night. Humans are rarely bitten because of the secretive behavior of these spiders. One home in Kansas is infested with thousands of brown recluse spiders and none of the inhabitants or their pets have ever been bitten. In general spider bites are most common when you put on a garment with a spider inside or accidentally crush one while you are sleeping or moving furniture or brush. They bite to protect themselves. Hannibal, our resident brown recluse, presented us with eggs two weeks ago. We can't wait for the blessed event. How do you avoid spider bites? When working in spidery areas such as sheds, attics, storage areas, basements, crawl spaces or when moving rubbish or wood wear gloves and long sleeved shirts. 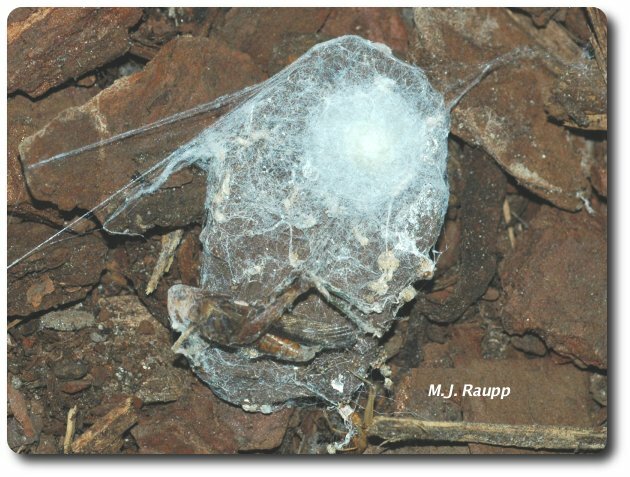 Get rid of trash and rubbish where spiders might hide outdoors. Seal windows and keep door sweeps in good repair to prevent spiders from entering the home. In garages, basements, and attics store clothing and sporting equipment in sealed containers or bags to prevent spiders from hiding within. What should you do if bitten by a spider? Try to capture the spider alive, dead, or in pieces after you have punished it. This will help a professional identify the spider and rule out a brown recluse. If you have been bitten and captured the spider and suspect it to be a brown recluse immediately contact your physician. Wash the site of the bite with soap and water, check with your doctor to see that your tetanus booster is up to date, use an antibiotic at the bite-site and hydrocortisone cream to reduce redness and swelling. Take an over the counter pain reliever to reduce discomfort. If your skin becomes infected or a rash develops, call your doctor. Is turn about fair play? One urban legend holds that humans ingest eight spiders that crawl into their open mouths as they sleep. Spider bites man. Man bites spider, food for thought. Special thanks to Patty Neger for providing the motivation for this Bug of the Week. Rick Vetter for identifying my recluse, and Nancy Breisch, Dave Wyand, Ellery Vodraska, Josh Wood, Kate Laskowski, Steve Frank, Doug Seely, and Ada Sczcepaniec for wrangling dangerous spiders and insects. For more information on recluse spiders and their bites, please visit the following web sites.